Having had the opportunity to travel to Japan this time one year ago, by coincidence it was during the eventful time of Halloween. Japanese are known to pick up American trends, and Halloween is no different. Walk into any Don quijote variety store or along the main shopping districts in Osaka or Tokyo (and other main cities) and EVERYWHERE you will see jack-o-lantern motifs and the whole assortment of decorations. Let’s not forget Disneyland in Tokyo and Universal studios in Osaka, which is pretty much Halloween central – Packed full of fancy dress, themed rides and shows. But behold, on the actual 31st of October the cities explode with colours, excitement and frenetic randomness of costumes that Japanese people pull of so well. I was in Osaka during this time and found myself wandering Dotonbori bridge (Very popular meeting place) amongst the choice fashions of the night. Suitably under dressed foreigners (case in point – myself) were mingling with the dressed up Japanese and were all too happy to pose for photos. I’ll let the photos explain how it went down. I must say I had a laugh when the two Barbies turned up – box and all. The whole night was a carnival of mischief, spontaneity and unashamed levels of character, which left me around 11.30pm and running to the nearest metro train station before the last train left. I dare say even though Halloween has turned into a commercialised means for retailers to make a whole wad of cash, I find myself lured and intrigued into the whole world of festivities. 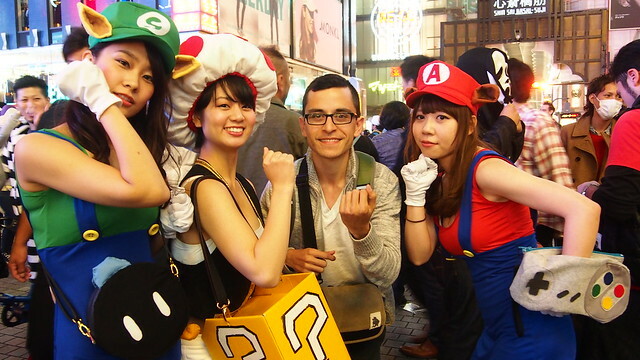 If I though the Osaka Halloween events were intense, I soon found out there were also events held in Japan – like the Halloween Parade in Kawasaki and Halloween gathering at Shibuya Crossing in Tokyo. The videos below aren’t by me, but show by EPIC the events are. 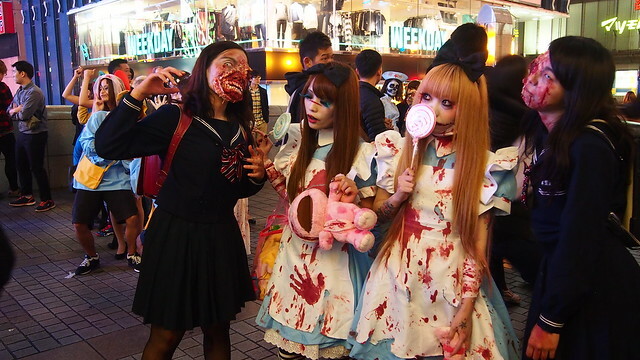 Halloween in Japan is ridiculously fun and intense, that I already look forward to booking a future trip to Japan during this eventful time – hopefully you will too!! This entry was posted in Asia - North and tagged halloween, japan, osaka, tokyo. Bookmark the permalink.